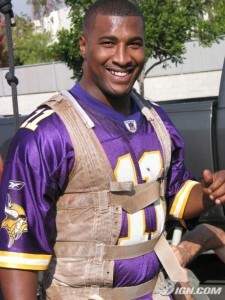 Quarterback Daunte Culpepper is on the verge of going from the NFL’s Detroit Lions to the UFL’s Sacramento Mountain Lions. Culpepper and the Mountain Lions are putting the finishing touches on a deal that will make him one of the league’s marquee names, according to sources familiar with the talks. Culpepper will be one of the first, but not the last, big-name players to jump from the NFL to the UFL this offseason, according to sources. Signing with Sacramento will reunite Culpepper with Dennis Green, the Mountain Lions head coach and general manager. The two men worked together in Minnesota and enjoyed some of their greatest professional successes together. Neither Culpepper nor Green returned telephone calls or texts seeking comment. But the deal is so close to getting done that sources said UFL commissioner Michael Huyghue is in Sacramento on Tuesday for a trip related to the Culpepper deal. In fact, Mountain Lions assistant coaches told players trying out for the team that Culpepper will be the starting quarterback for Sacramento this season. Culpepper spent last season with the Detroit Lions but struggled to find work this offseason. He even showed up at the NFL owners’ meetings in Orlando to see if he could find a job. Adrienne Nicole Martin found dead!